We’re back to traveling through populated areas. There are even French fries and mashed potatoes back on the menus. We had a rainy day yesterday in Хабаровск. This morning it was cloudy and threatening to rain again, but fortunately it stayed dry. 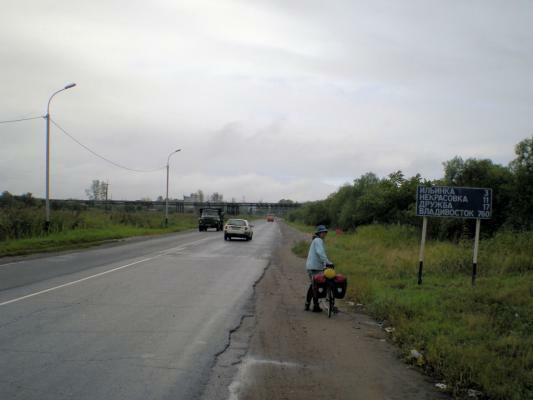 We cycled the main ring road and from there had busy traffic as we slowly circled Хабаровск. 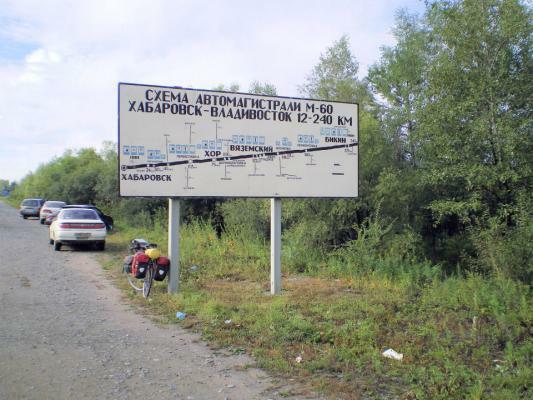 At 13km we left city limits and at 22km we intersected the main road to Владивосток. It was nice to finally see Владивосток appear on road signs. The road was busy with many dump trucks but otherwise in good condition. We had some gentle grades to climb over. 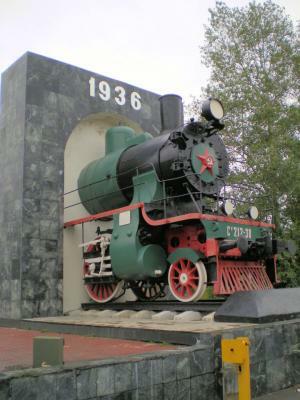 At 36km was Корфовский. Here was a cafe. It was also the point where dump trucks turned off. After this the hills were less steep and it was more swampy areas. The sun came out briefly and it was nice riding. At 81km we had another stop at Хор at a small store and at 86km at a cafe. People now assume we are going to Владивосток and think of Amsterdam as being far. We cycled further to 104km to get water and then looked for a place to camp. There was a lot of standing water in the swampy areas and many mosquitoes. I was quick to set up the tent and jump inside. Hopefully they will be less tomorrow morning.